Peel and finely chop the garlic. Remove the seeds from the red chilli and cut the flesh into very fine slithers. Peel and grate the ginger. Slice the spring onions on the angle. Pick the leaves from the mint and coriander and roughly chop. Heat a frying pan to very hot. Add a splash of sunflower oil and then the squid. Cook until golden (no more than 1 minute), turn over and add the chilli, garlic and ginger. Cook for 30 seconds and add the soy sauce to the pan. Remove from the heat and squeeze on the juice from 1 lime. Fold through the chopped herbs and spring onions. 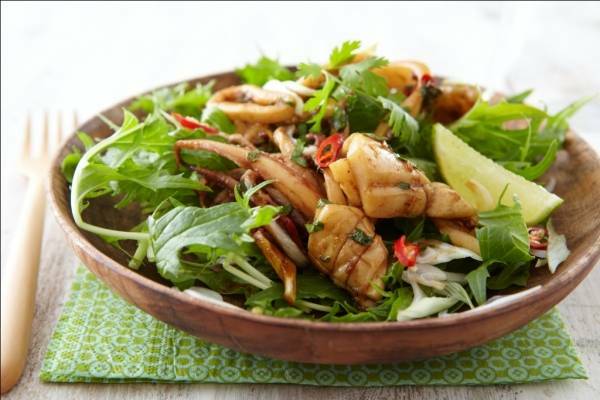 Serve the squid on a bed of mizuna leaves and garnish with a wedge of lime.